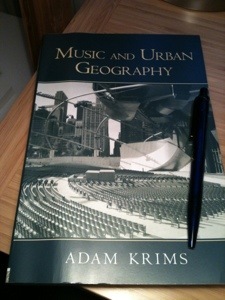 At the moment I’m working on a piece that responds to Adam Krims’ book Music and Urban Geography. It will hopefully appear in an early issue of the exciting new Journal of Urban Cultural Studies. I’ve been asked to write a short form piece and my plan at the moment is to pull together the key ideas and features from Krims’ book and to develop these a little through some other literature. One of the key features of Krims’ accounts are the deeply woven interconnections between music and the city. Krims talks about the representation of the city in music, but he extends the analysis to think about how the structure and form of the music is connected into place and how the music itself becomes a part of the structures of urban space. I’m arguing that the result is a really situated and embedded analysis of the multiple dimensions of music and urban geography. Krims doesn’t really unpick these different interconnections, instead he tries to study them as they weave together. He does this through various case study examples, that are often quite quirky and unusual. To give an example, the central idea of the urban ethos is set up using Petula Clark’ song Downtown (which segues into 50 Cent). Later the film Boogie Nights is used to work through the role of filmic representations of an imagined past. 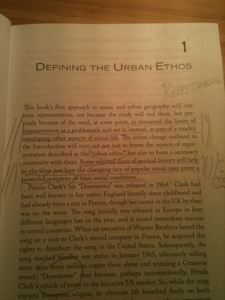 The urban ethos idea is really the crucial concept within the book. Krona uses this central idea to try to think about the way in which urban change (and by association, social change) reflects and is shaped by musical change (which is obviously an example from wider cultural change). It’s a fascinating and really thought provoking book. If it’s accepted, my piece will be part of a tribute to Adam’s work. 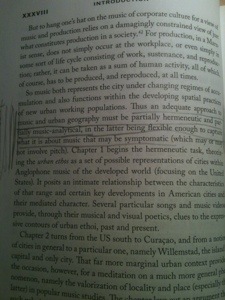 This entry was posted in music, space and tagged Music, urban geography. Bookmark the permalink.